Looks like Josh is getting evicted. 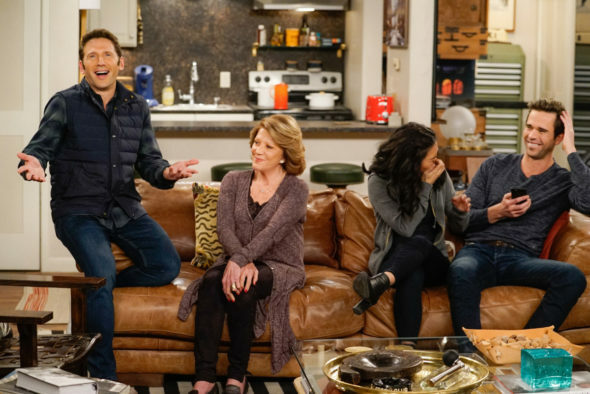 CBS has cancelled its 9JKL TV show, after just one season. In November, the Tiffany Network ordered three additional scripts and subsequently the full episodes, but it seems that’s where the good news ends. It is “effectively cancelled,” according to THR, although the news outlet didn’t bother with any qualifiers in its tweet on the 9JKL cancellation. A CBS sitcom, 9JKL stars Mark Feuerstein, David Walton, Elliott Gould, Linda Lavin, Liza Lapira, Matt Murray, and Albert Tsai. From creators Dana Klein and Feuerstein — a married couple — this sitcom is loosely inspired by the time they spent living next door to Feuerstein’s family. It centers on newly divorced actor, Josh Roberts (Feuerstein), who moves from LA, back to New York City, to an apartment between those of his parents, Harry and Judy (Gould and Lavin) and his brother Andrew (Walton) and sister-in-law Eve (Lapira). The first season of 9JKL averaged a 0.96 rating in the 18-49 demographic and 5.29 million viewers. When we sort the 25 scripted CBS TV shows we’re tracking by the demo, 9JKL currently ranks 15th, but drops to 20th place in terms of average total viewers. As referenced in the tweet above, yesterday, CBS pulled Living Biblically from the schedule, and it seems to be cancelled, too. Meanwhile, Me, Myself and I has been considered over since early November of 2017. What do you think? Did you watch the first season of the 9JKL TV series? Do you think it should have been cancelled or renewed for season two on CBS? More about: 9JKL, 9JKL: canceled or renewed?, 9JKL: ratings, CBS TV shows: canceled or renewed?, Living Biblically, Living Biblically: canceled or renewed?, Me Myself & I, Me Myself & I: canceled or renewed? I watched a few episodes and tried to like it but it was just too stupid. No loss. Royal Pain was MUCH better! I loved the show and am disappointed that the networks never give enough of a chance to gain an audience. This was funny and well written. The cast was superb. And Linda Lavin rocked!!! I watch most new shows and where many get cancelled from my DVR this was one that I looked forward to watching. It’s too bad.